A relationship of extremes, Beatrice Marshoff and Ace Magashule locked horns during her tenure as Free State premier from 2004 to 2009, creating a taxing and hostile work environment for Marshoff. Looking back, however, she still manages a few heartfelt utterances for Ace. "As an individual [he] is very charming, he is a nice warm person," she says. "But when he interacted with you as the chairperson of the ANC in the Free State, he was vicious." Marshoff, who has recently been quoted in Pieter-Louis Myburgh's explosive new book Gangster State: Unravelling Ace Magashule's Web of Capture, spoke to News24 about the "challenging yet rewarding" environment she worked in as premier of the Free State and life after politics. Stepping into office as premier, it didn't take long for Marshoff to realise that she had to constantly be on high alert. "I got the impression I was seen as an opposition member to the ANC. I was under tremendous attacks from my own organisation and there was a constant call for me to be recalled," says Marshoff. "I never felt helpless, I had a purpose… I sometimes felt a little intimidated perhaps by the amount of resentment by the ANC in the province. Although I had cordial relationships with everybody, at some stage their attitudes changed." "It was very unsettling because you never knew who you were dealing with, which personality you were dealing with today – is it someone who is going to be supportive? Is it someone who is going to attack you? Is it somebody who is going to whisper somewhere along the way about you? So you had to be on your guard all the time." Despite this, Marshoff says she enjoyed her work and saw the challenge as something exciting, always asking herself, "what more can I do?" Working with Magashule, however, had its own particular set of challenges: "He is a nice, warm person," says Marshoff, "but to function with him at that level was very challenging. You had to be alert at all times, you didn't know what was going to come your way […] You needed to know how to respond to Ace and how to relate to him." After a stressful and dramatic term as premier, Marshoff decided to quit politics in 2009 and a year later went back to her original profession of nursing. Two days before she was to be sworn in as a Member of Parliament, Marshoff said she took time out to reflect on her career after which she resigned. "I thought to myself, I am still young and I still have a contribution to make to society, so I decided to go back to what I know – I went back to nursing." "I am a theatre scrub sister," says Marshoff, "I worked a few days a week and for a while I worked at Mediclinic in Bloemfontein and then I retired three years ago." During Marshoff's retirement, a young journalist approached her regarding a book he was writing. Before Marshoff agreed to let Myburgh interview her, she did what she always does and spoke to her loved ones. She took time to contemplate adding her voice to Gangster State. Now that the book is out, Marshoff says her family is still supportive but cautious for her safety. "I am not in the Free State, I don't know what would happen if I go back to visit – if the attitudes of the people in the province would have changed. But I've had a lot of positive feedback from people." Marshoff says she is in the midst of reading Myburgh's book and has appealed to those opposing the book to read it first. "I think people are emotional. Read the book first and interpret what is in there and then decide whether you like it or not. To go to the extent to threaten a bonfire, I think that is a bit immature and wrong." "I think this is a book we should all read. It is something that tells us a lot of things and it is something we can learn from." 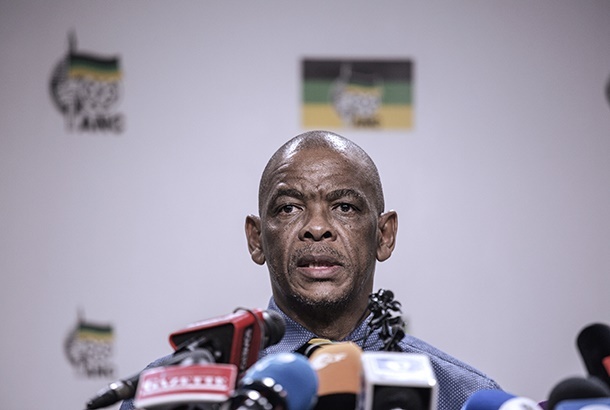 OPEN LETTER TO CYRIL RAMAPHOSA: Is Ace Magashule's ANC your ANC?